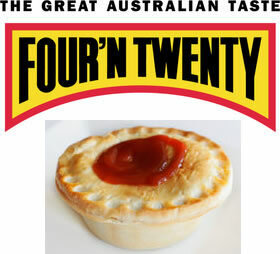 July 12 2003 - From next month the iconic Four'n Twenty meat pie will not only be Victorian-made, but also Victorian-owned. Gippsland company Patties Bakery yesterday announced it had bought the brand from US-based company Simplot, after months of negotiations. In a deal worth tens of millions of dollars, Patties will also acquire the Herbert Adams, Wedgwood, Great Australian Pies and Nanna's pastry brands. "Patties is buying back the farm," said managing director Richard Rijs. Patties' upgraded Bairnsdale factory is expected to roll out 20,000 pies and 60,000 party pies an hour. Mr Rijs said the deal would add 100 jobs to the 200-odd staff already employed by Patties and annual turnover is expected to be triple the present $35 million. However, the news was not so good for 260 staff at the Simplot factory in the Melbourne suburb of Kensington, where Four'n Twenty pies are made at present. The workers have been told they will lose their jobs after the sale to Patties. The Australian Manufacturing Workers Union will meet members and the company on Monday to discuss workers' futures. A Victorian company has defended sacking 239 workers yesterday. American-owned food company Simplot sold its products, which include Four-N-Twenty pies, to Gippsland pie makers Patties. Simplot managing director Terry O'Brien says the workers were told within the time specified on their enterprise bargaining agreements. "I can tell you four weeks ago this contract was a long way from being consummated and we wouldn't have been in a position to alert anyone under confidentiality or commerciality," Mr O'Brien said. But unions representing the Kensington factory workers have not ruled out industrial action. Australian Miscellaneous Workers Union (AMWU) Victorian secretary Dave Oliver says unions should have been told the company was negotiating a sale. "We're amazed a company like Simplot would pull an ambush like this," Mr Oliver said. "It just shows these corporate cowboys have got no consideration for their workers to wait for Friday afternoon to advise them, 'well, the good news is the company is back in Australian hands but the bad news is you've lost your jobs'," he said. FOUR'N Twenty pies are back in Aussie hands after almost 10 years of American ownership. Gippsland-based Patties Pies has bought the famous brand, which is synonymous with Australian rules football. The deal with US food giant Simplot for an undisclosed sum was signed yesterday. The move has been hailed as a win for Australian ownership. But 290 workers will lose their jobs at the Four'N Twenty factory in Kensington when production moves to Bairnsdale, along with associated brands Herbert Adams, Wedgwood and Nanna's. Patties' managing director Richard Rijs said he was delighted to return the popular brand to Australian control. "We're just so proud we have been able to do it," he said. "It's going to be an absolute fillip for Bairnsdale, bringing a lot more jobs into the area." Simplot managing director Terry O'Brien said the company had a new strategic direction that did not involve pies. National Party leader Peter Ryan welcomed the move to Bairnsdale. "Not only does it entrench Patties as a leading market player, it is also great news for jobs and regional development in East Gippsland," Mr Ryan said. "It is a reversal of the trend that has seen numerous Australian icons fall into foreign hands." Previous Australian owner Pacific Dunlop sold Four'N Twenty to Simplot in 1995 as part of a $460 million deal. Foodservice major Simplot Australia has sold it's well known Four'n Twenty, Herbert Adams, Wedgewood, Great Australian Pies and Nannas savoury pastry brands to Victorian Bairnsdale based Patties Bakery. Patties is an Australian family owned business with 37 years of experience in manufacturing and distributing pastry products throughout Australia and New Zealand. Simplot will now concentrate on its heavyweight core brands of Edgell, Birds Eye, Leggos, I&J and the recently acquired John West. Particularly, Simplot is maintaining its pursuit of convenient, healthy and nutritious foods. The company though is keen to exit the bakery sector, saying the industry is contracting in the face of growing consumer choice. There's additionally a fair oversupply of capacity, which typically doesn't conform with the company's strategic criteria. Simplot will therefore shut down its Kensington bakery plant, retrenching all employees including the sales team. Employment and personal counselling along with financial planning services have been offered to departing staffers. Patties Bakery recently underwent an $11 mln upgrade - familiar products including frozen pies, patties and sausage rolls sold under the Patties and Snowy River brand names. For some reason, some people think the company name is spelt with a 'double d' as in Herbert Adams, but the nannas.com.au web site clearly shows it is Herbert Adams since 1909.